Lebanese American University Board of Trustee member Peter Tanous is President of Lepercq Lynx Investment Advisory, LLC. Mr. Tanous has spent his entire forty-year career in the field of finance and money management. 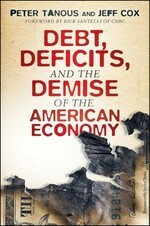 On September 15, 2011 he sat down with LAU’s Greg Houle to talk about his new book (co-authored with Jeff Cox) Debt, Deficits, and the Demise of the American Economy (Wiley).